The Australian Museum Diprotodon Exhibition is housed at the Coonabarabran Visitor Information Centre, on the Newell Highway, at the southern end of town. The exhibition displays the skeleton and skull of a Diprotodon, the largest marsupial ever to have lived. It is often likened to a giant sized wombat. The remains of the Diprotodon were found in the creek bed of Cox's Creek near Tambar Springs in 1979. Launch into Coonabarabran, the Astronomy Capital of Australia, and experience New South Wales newest self-drive touring route - 'The World's Largest Virtual Solar System Drive! 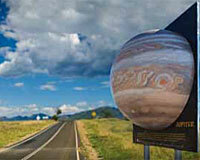 Start at the regional towns of Tamworth, Dubbo, Gulgong, Moree and Merriwa and hurtle your way through space from Pluto towards the huge eight storey high Anglo-Australian Telescope dome at Siding Spring Observatory which represents the sun and central point of the solar system model. Night Sky Show. Milroy Observatory offers breathtaking tours of rich star fields in the Milky Way and beyond, through the largest public telescope in the southern hemisphere. 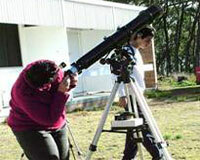 Be captivated as you also see nebulas and planets through the refurbished 15 ton telescope! School Holiday Fun in the Warrumbungles in the Autumn, Winter, and Spring School Holidays. Discover nature's classroom on Discovery Ranger guided walks, talks, and tours in the Warrumbungle National Park. Discovery Programs operate during autumn, winter and spring school holidays. The 90 minute show at the Warrumbungle Observatory includes an astronomy presentation while sitting under the stars and live video images of the Moon and planets. Learn how to navigate around the night sky, observe through up to six telescopes, including the new 20-inch telescope, and have the opportunity to take photos of astronomical objects with your SLR camera. Siding Spring Observatory is Australia's premier optical astronomical research facility. Located 27 kilometres west of Coonabarabran on the edge of the Warrumbungle National Park, it is the home of Australia's largest optical telescope, the 3.9 metre Anglo Australian Telescope, and the Australian National University's 2.3 metre Advanced Technology Telescope. Coona Astro Ventures, provides day time solar observing, evening telescope viewing and night sky tours for bus groups, schools and the public in Coonabarabran and Baradine. They offer, as part of the University of Southern Queensland Astronomy in Schools Program, a service for schools to experience the wonders of the night sky and learn about astronomy via classroom sessions and talks. The Woodpecker Gun is a War Memorial to those who served in the Second World War. The Japanese Machine Gun, which is at the front of the Memorial Swimming Pool, adjacent to the Coonabarabran Visitor Information Centre, was captured on August 3, 1945 during combat in New Guinea and is a free attraction to visit. Coonabarabran's newest attraction, the Goanna Tracks Motocross and Enduro Complex has adrenaline pumping and engines roaring. Enjoy all styles of Motocross, Supercross, Enduro, Endurocross, FMX, ATV's and Trials. The complex caters for all riders - from junior riders through to experienced riders. Crystal Kingdom is the home of one of the world's most unique mineral collections, the "Minerals of the Warrumbungles". See the world's rarest and most colourful Zeolite Crystals and learn about how the Coonabarabran area was once home to not one, but two volcanoes. Experienced staff are available to explain the fascinating origin of these extinct local volcanoes. Nestled on the edge of the Pilliga Forest, Pilliga Pottery is renowned for being the only pottery in Australia to use a specialised technique of applying bright glazes and engravings to terracotta. This method produces a stunning lead light effect, which brings the unique designs to life. Visitors are welcome at Pilliga Pottery and Bush Cafe. A labour of love established in 1993, Coonandry Wines was the first wine to produce a Chardonnay and a Cabernet Sauvignon that are both hand picked and pruned. 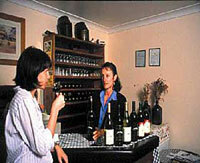 Open weekends for tastings and cellar door sales. 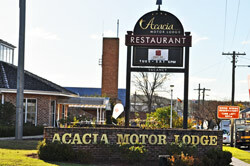 Just five minutes from the township of Coonabarabran. 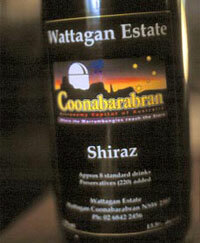 Located only a short drive north east from Coonabarabran on the Oxley Highway, Wattagan Estate Winery is a rural winery producing nine wine varieties. Open for wine tastings and cellar door sales.